It is no longer just the Morales government versus the four departments of the Media Luna, all of whom have passed autonomy referenda seeking to distance themselves from the centralized control of the MAS regime in La Paz. 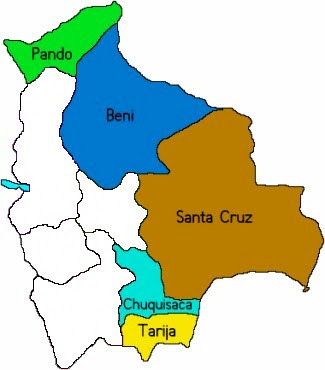 Now the conflict has expanded to include the Department of Chuquisaca, which has joined, at least in part, its sister departments of Santa Cruz, Tarija, Beni, and Pando in a confrontation with Morales and the MAS. The four Media Luna departments all have imposed a full-scale Paro (shutdown) of major road transit within their borders, demanding the redistribution of the equivalent of $166 million U.S. collected as the Direct Hydrocarbons Tax, or Impuesto Directo a los Hidrocarburos, a.k.a. the "IDH." The departments are demanding a return of these tax revenues to local authorities because earlier this year, Evo Morales unilaterally cut off their distribution without the approval of the Bolivian Congress, ostensibly to use the funds to pay old age pensions (La Renta Dignidad), but also as a means of punishing the departments for pursuing their individual agendas for establishing autonomy. The situation is tense and there are confirmed reports of violent attacks in the Department of Santa Cruz launched against news reporters by MAS activists. 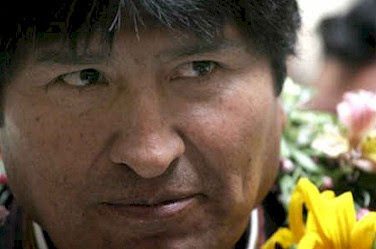 It appears that the conflict between Evo Morales and his opposition may be coming to a head. A general stoppage of transit activity in the four departments of the Media Luna began Monday in Santa Cruz as a protest manned by some 5,000 unionists, local fraternal organizations, carnival workers, and neighborhood groups to put pressure on the Morales government to accept the distribution among the departments of previously-shared IDH revenues. The local commitment to support the effort was widespread, even extending to the point of supermarkets opening for special hours late Sunday night to permit residents to stock up on necessities in anticipation of a long struggle. 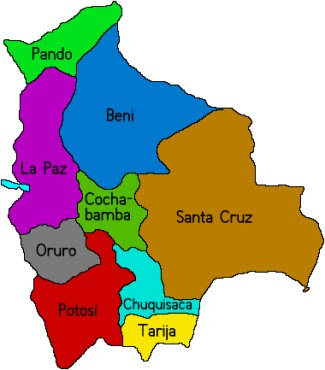 The other three departments of the Media Luna; Beni, Pando, and Tarija, also followed suit and Chuquisaca joined in supporting the demands. Most of the first day's activities were peaceful. Morales government officials and MAS supporters both within the five protesting departments and in the capital of La Paz immediately announced their intent to oppose the Paro. In what may have been the most significant act, the National Electoral Court declared the opposition Podemos Party, which predominates in the Media Luna, to be an illegal organization and stripped it of official recognition under Bolivian law. MAS activists and organizations also began organizing their own actions within the five eastern departments, often acting in concert with government organs, such as in their takeover of the offices of telecommunications provider ENTEL in Tarija, which gives them control over telephone and internet use throughout the department. And in the municipality of San Julian, a MAS stronghold in the Department of Santa Cruz, Morales allies announced their own stoppage in protest against the Paro and, perhaps ludicrously, threatened to encircle the departmental capital of Santa Cruz de la Sierra if the protest against the central government continued. On Tuesday tensions began to surface in a neighborhood within the city of Santa Cruz known as Plan Tres Mil (Plan Three Thousand), a social development project organized over 24 years ago for what was originally intended to house some 3,000 families, but which has since grown to become a satellite city of tens of thousands in its own right. The chronology of the day began at about 4:00 a.m. with initial assaults by MAS supporters against the press and the destruction of vehicles, which they later continued in a walkthrough of the vicinity terrifying local residents. By 1:00 p.m. bands of MAS supporters roaming the Plan Tres Mil barrio were confronted by pro-autonomy activists, including members of the Union Juvenil Cruceñista, the youth group who led the violent confrontation the previous Friday against National Police units in Santa Cruz after the police roughed up handicapped demonstrators seeking government relief. 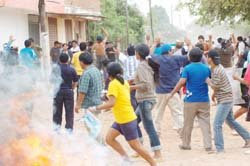 When new police units arrived on the scene, a stone-throwing confrontation ensued with the Union Juvenil and only the use of tear gas dispersed them. 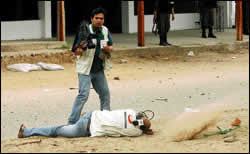 By 3:00 p.m. the MAS bands in the area had begun new assaults against journalists, forcing them to abandon the scene after several of their number were injured. And in the aftermath of this withdrawal, which evidently coincided with the retirement of the police, the MAS supporters virtually sacked the local stores adjacent to the barrio. 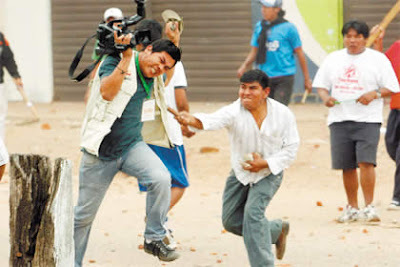 It is worth noting that when the National Press Association of Bolivia denounced the violence against journalists later that day that they specifically affixed responsibility for most of the attacks upon Evo Morales and his MAS party. A newspaper didaction of their statement said "that the head of state makes the most of every national and international occasion to present himself denigrating and demeaning the media, the [National Press Association] interprets this attitude as reflecting a government strategy." They also criticized opposition groups for attacks on the press on various occasions, though the complaint was more subdued. From the first day of the stoppage begun in the Media Luna, Bolivian farmers affiliated with the MAS in Chuquisaca began to organize their own counter-blockades, reportedly in protest against recently-elected Prefect Savina Cuellar's refusal to accede to their demands for the naming of provincial authorities within the department, though the intent to distract her from assisting the Paro in the four Media Luna departments is obvious. Cuellar faces an unusual situation. Her department is mostly of Quechua ethnic origin, which distinguishes them from the largely Aymaran majority of Bolivia's west. She is a former MAS ally who broke with the party during the deliberations of the constituent assembly last year when MAS supporters roughed up Chuquisacan protestors, three were killed, who demonstrated for the transfer of the nation's capital to the city of Sucre, in her department. She then helped form the Interinstitutional Committee of Chuquisaca as a challenge to the MAS, which enabled her election as Prefect on June 29, making the committee the principal political power in the department. She originally sought an accommodation with the central government, because her department is sorely in need of funds to build major highways, which she announced as her principal policy goal during the campaign. But Morales did not act to develop a working relationship and Cuellar has since gravitated much closer to the Media Luna and she has even announced plans to schedule an autonomy referendum for Chuquisaca for November 23, following the pattern of her neighboring departments. It is within Chuquisaca that the MAS appears to be focusing its primary effort to undermine the inter-departmental Paro, apparently believing that their strength among the Chuquisaqueño farmers gives them a sufficient base to act and perhaps believing that Cuellar is more vulnerable than the prefects of the Media Luna. They have imposed a virtual blockade of the departmental capital of Sucre, which is now beginning to create a shortage of meat, and prices are beginning to rise there. Cuellar has asked for dialog with the MAS activists and they have thus far refused and tensions appear to be running high. As of this moment, Saturday, August 23, it is difficult to see an end to the conflict. In Tarija the prefect has led a closure of the main highways connecting Bolivia to Argentina, which has implications for commerce in foodstuffs destined for La Paz, and he is demanding the withdrawal of officials of the National Institute of Agrarian Reform, a MAS-dominated arm of the bureaucracy, as well as a "leveling" of the price of natural gas exported from the Chaco gas fields of the department. MAS activists in La Paz are calling for a second Cerco (siege) of the national congress to force it to submit the Morales constitution to popular referendum vote, an exceptionally dangerous idea that most certainly will aggravate tensions with the eastern departments, given that their elected representatives were violently prevented from voting against the text of the document when it was submitted in the constituent assembly in late February. And there are significant anxieties throughout the country over the long-term consequences of the conflict for the availability of foodstuffs, since most of what the western departments consume, especially meat, either originates in or is transported through the five eastern departments of the Media Luna and Chuquisaca. And calls for dialog seem to emanate from all parties, but the strident political positions held by those concerned are not leading to negotiations as of this moment. The Death of Constitutional Law in Bolivia? While there are geographical, historical, demographic, and ethnic factors that form the basis for the distinct attitudes among Bolivians towards the future course of their country, the immediate underlying issues defining Bolivia's political crisis are the manner in which Evo Morales and his MAS party have attempted to rewrite and impose a new constitution outside the framework of Bolivian constitutional law and the equally unconstitutional response of the eastern departments to form autonomous governments with only limited control from La Paz, a course of action that now appears institutionally weak without the simultaneous creation of a revenue base. 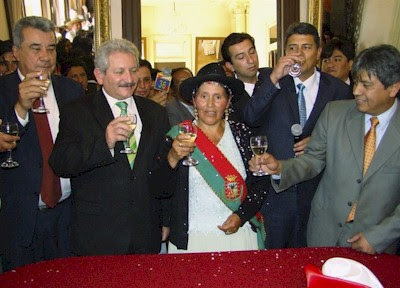 Morales and his MAS allies found themselves unable to write the new constitution according to their own wishes during the constitutional assembly in 2007 as they lacked the two-thirds majority necessary to pass their proposals above opposition objections. They then decided to move the proceedings to a military base and, at the end of February this year, they presented the final document for the assembly's approval, still not possessing the two-thirds majority required to pass it. On the day of the vote, in an event now known as El Cerco (the siege), MAS demonstrators encircled the assembly building and violently prevented opposition delegates from entering the hall to cast their vote, thus assuring its passage, which was the penultimate stage prior to its submission as a popular referendum, whose outcome would likely favor its approval. As a response to Morales's decision to circumvent the regular proceedings of the constituent assembly, the four eastern departments of the Media Luna began to undertake their own independent initiatives to pass referenda establishing their autonomy from the central government in La Paz. This followed a failed attempt to secure this recognition by national referendum earlier in 2006, a procedure whose outcome would have been recognized under Bolivian constitutional law. In December, 2007 Santa Cruz announced that it would schedule its own autonomy referendum vote within its borders and the other three departments followed suit after the MAS violently secured passage of their constitution at the constituent assembly in late February. 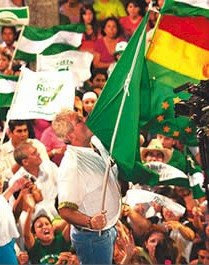 In a series of votes conducted between May 4 and June 22 of this year, each of the Media Luna departments approved its individual autonomy referendums, though Bolivia's constitutional tribunal -- whose authority was seriously undermined by the resignations of four of its five members -- declared the procedures illegal. They also pronounced the MAS constitution illegal and Morales refrained from submitting it to a national referendum vote, though he has refused to take it off the table and still seeks to negotiate acquiescence to its submission to a popular referendum vote from the dissenting eastern departments. It is precisely the possibility that Morales may be able to force a vote on a constitution that cleared the constituent assembly by means of street violence that is pushing the autonomy process ahead. I see three possibilities for the future: 1. Negotiate Mutual Acceptance of the Status Quo - Evo Morales and the eastern departments can sit down and negotiate a revised constitution that incorporates both the autonomy referenda and the new MAS constitution. This is the proposal discussed most often in the press outside of Bolivia and it is what Morales is requesting, but I believe this is a highly unlikely outcome because the eastern departments have no trust in Morales to keep his word on any arrangement that will be negotiated. They have good reason to fear this approach since Morales and the MAS have ignored the current system of constitutional law and it is therefore not unreasonable to expect that they would repeat such behavior in the future. 2. Restart or Rollback the Constituent Assembly Process - The constituent assembly can reconvene and either begin from scratch respecting the procedures of Bolivian constitutional law as they now exist or they can simply return to the process as it existed prior to El Cerco and hold the vote on the submitted document a second time with all delegates permitted to vote. This option would negate the relevance of the autonomy referenda and would force the constituent assembly to create a compromise document. It has no appeal to Morales and the MAS but it is the only option that can form the basis for real dialog. The MAS constitution only made it out of the assembly by virtue of revolutionary violence and it must be rejected if there is to be any chance of reassuring the eastern departments that they will have a future under enforceable constitutional law. 3. Let the Current Process Play Itself Out - The present process can play itself out to determine a final victor. This is a very dangerous route and it almost certainly will lead to widespread and tragic violence. And it could mean the end of the nation of Bolivia as a viable state within its current borders. I dearly hope this does not come to pass, but as of this moment it is the chosen alternative. Did a Major Obama Fundraiser Support the Iraqi Insurgency? It looks like the answer is "yes," Code Pink founder and major Obama fundraiser Jodie Evans spoke of her support for the Iraqi insurgency and, furthermore, may even have described Osama Bin Laden's attack upon the U.S. as legitimate. The Obama campaign has been asked to disavow Jodie Evans, who raised between $50,000 and $100,000 for Obama according to the campaign's own website, but they have not done so as of this time. The Matrix has posted on this at The Neoconexpress, where you can read more. They have done it before. And so long as they exist, the horrible truth we must all face is that they likely will do it again. The FARC and murder are still synonymous. Forget the cautious and protective advocacy of so-called human rights organizations and other NGOs on behalf of these narcoguerrillas. Forget the political spin of their pro-Chavez apologists who try to tell us the FARC have a popular base of support in Colombia rooted in an ever-present problem of endemic poverty that the developed world cannot grasp. And especially forget the FARC's own statements in which they attempt to cast themselves as the last group of romantic guerrillas still standing after all these years. The FARC are just plain murderers. Last Thursday night in Ituango, a small town located in the north of the Department of Antioquia, they reminded anyone who may have forgotten. While local residents celebrated an annual fair they call Ituanguinidad, i.e. "being Ituanguan," an explosive device placed in a trash can in the vicinity of several local shopping stalls exploded, killing seven and wounding approximately fifty others. The region has been the focus of recent efforts on the part of the Colombian military to eradicate FARC-managed coca cultivation, which immediately identified the perpetrators. Antioquia Police Commander Colonel Luis Eduardo Martinez affixed responsibility for the attack to the FARC's 18th Front and stated that it was committed "in retaliation against the campaign to eradicate illicit crops." Colombian authorities have detained and charged one Jhon Jairo Ortiz, known by the alias El Pajaro (the bird), and charged him in the attack, accusations which he has denied. It also may be worth adding that several top FARC commanders have been killed this year, including Raul Reyes and Ivan Rios, which might be encouraging the narcoguerrillas to retaliate. 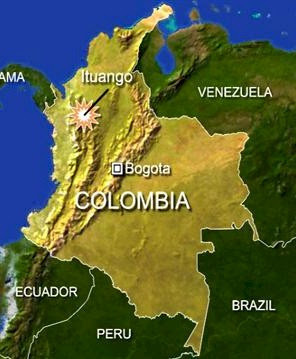 Colombian President Alvaro Uribe traveled to Ituango afterwards, along with Defense Minister Juan Manuel Santos and Luis Alfredo Ramos, the Governor of the Department of Antioquia, to meet with the townspeople personally. Uribe spoke to local reporters on the scene, saying "we must have solidarity with the community and support it. And reaffirm the steel will we have in the defeat of terrorism." He announced that he would enlarge the local police authority in the vicinity and that the Colombian government would pay an indemnity to the families of the victims in an amount equivalent to about $5,400 U.S. In a year in which Colombia's struggles with the FARC have been much in the news, the aftermath of the Ituango attack has resulted in uncharacteristic expressions of solidarity with the country and its people. Human Rights Watch issued a press release that was outstanding for its very rare mention of the FARC with no simultaneous allusion to the Paras, the usual tactic HRW has followed when addressing -- and subtly supporting -- the narcoguerrillas. 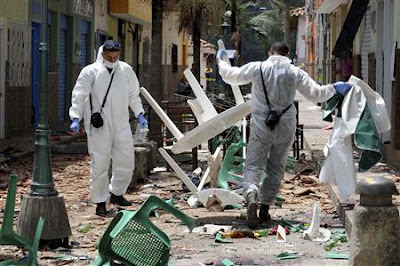 HRW did not fault the Colombian government for inattentiveness to the population because they recognized that officials in Bogota previously had issued a warning to the citizenry in Ituango that they might be at risk from a FARC attack. The office of the High Commissioner for Human Rights of the United Nations in Bogota issued its own statement of condemnation, and even went so far as to describe it as typical "of a war crime." But in perfect keeping with the twilight zone perspective of the UN, the commissioner requested that the FARC Secretariat "assume publicly the full subjection of its organization to respect humanitarian norms and to teach its members the order to fully respect their humanitarian obligations." A much more meaningful step was the action Interpol took in response, in which they issued an order for the capture of Rodrigo Granda, the "Foreign Minister" of the FARC, who has enjoyed international immunity for over a year, permitting him to travel abroad frequently. Henry Cobas, speaking for Interpol in Bogota, stated that they were working "through Interpol channels" to coordinate the capture and extradition of the FARC leader whose seizure in Venezuela and transfer to Colombia in 2004 provoked an international incident between the two countries, leading to the arrest and imprisonment of Venezuelan Lieutenant Colonel Humberto Quintero, who remains a political prisoner in Chavez's jails to this very day for the "crime" of arresting Granda. Perhaps Humberto Quintero's case deserves another look? Forgive me, for I diverge from the subject at hand. I was thinking of justice. Though there appears to be some movement in international opinion to marginalize the FARC recently, and especially in the wake of events this year such as the release of the Interpol report on the Reyes laptops and the daring rescue of Ingrid Betancourt and the 15 other FARC kidnapped hostages, I am still disappointed that this event has not been publicized more prominently. We're still largely dependent upon news sites and those very few blogger-heroes who keep an eye open, like Martha Colmenares (¡Que Dios te bendiga Martha! ), and a couple of others. The time has come for everyone to demand an end to the atrocities of the FARC. It's just plain and simple murder, nothing more. It appears that in the wake of last Sunday's referendum vote in Bolivia, in which Evo Morales secured a ratification of the continuance of his presidential mandate, that tensions are increasing between his central government and the pro-autonomy movement in Santa Cruz. 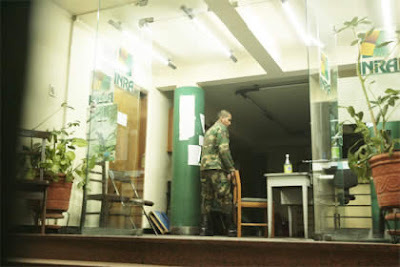 Following a demonstration that degenerated into a riot that left over 25 people injured; the local commandant of the National Police in Santa Cruz has resigned, Santa Cruz Prefect Ruben Costas has refused to recognize the appointment of a replacement and demanded that future authority over the police body be transferred to his department, the Bolivian Army has occupied local instances of national government offices, and disaffected cities in the Department of Santa Cruz who disavow the autonomy goals of the majority have initiated their own blockades and stoppages of all activity, spreading the conflict throughout the region. Though complete details are still lacking at the moment, apparently a demonstration organized in the city of Santa Cruz on behalf of handicapped Bolivians who are seeking increased government benefits resulted in a rough physical clash that worsened after the Union Juvenil Cruceñista -- who can perhaps best be described as a youthful pro-autonomy group who function as a militia in every way except armament -- joined the demonstrators and turned the occasion into a full-scale riot whose results are still unfolding and which may portend for calamity. In the aftermath, the sitting commandant of the National Police in the city resigned, quitting after sustaining injuries in the conflict that continued into Friday evening, though evidently he recognized the excesses of those police under his control as he offered a public apology for their rough handling of the handicapped protestors. Prefect Ruben Costas has declared that he will not recognize the reappointment of a replacement and that the agency must be transferred to local control. The central government in La Paz has responded with alarm and even a local newspaper in Santa Cruz has stated that the department has "rebelled." The Morales government has treated the matter seriously, especially since one of the key elements involved is the conflict over the distribution of government-collected oil and gas revenues, which has resulted in La Paz ordering the Bolivian Army to seize offices of national government agencies in Santa Cruz and comparing the threat level to that of a 1971 coup. Finally; complicating matters even further, two local municipalities in the Department of Santa Cruz whose residents are largely opposed to the autonomy movement have decided to organize their own counter-blockades and stoppages in protest over the actions Costas and the Santa Cruz Civic Committee are leading in the department's capital. The cities of San Julian and Yapacani have each ordered stoppages for Monday and are threatening additional action. At this distance it is difficult to sift through the posturing and threats, since it seems that so much of the public discourse is typified by an intense rhetoric that can only be described as "over the top," which seems to be the norm these days in Bolivia. I do feel that a couple of things deserve mention however. Ruben Costas and the Cruceño autonomy movement need to take action to reign in the Union Juvenil Cruceñista. 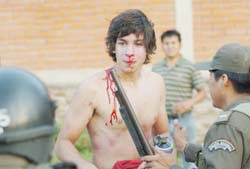 Even though a number of reports state that the National Police in Santa Cruz overreacted in their handling of handicapped demonstrators, there was an apology offered by the resigning police commandant after all, there is also widespread agreement that the Union Juvenil intensified the violent nature of the confrontation after their arrival and most assuredly transformed the situation into a more threatening one than circumstances required. By leaning on the Union Juvenil, whose actions bring nothing but discredit and disrepute upon all who associate with them, the supporters of autonomy are wasting some of the moral capital they have earned in standing up to the overt disregard for constitutional law Morales has shown. I believe that the issue of the local distribution of the oil and gas revenues probably looms larger than has been reported thus far. I revealed in my last blog entry that Costas announced the coming formation of a taxing authority to pool revenues for a fund to be shared with the other departments seeking autonomy and I believe this action is viewed in La Paz as particularly threatening. It also appears evident that a meeting earlier this week among several department prefects with Evo Morales did nothing to further the cause of dialog. This is still the big issue. So long as Morales continues to leave the draft of his proposed constitution on the table, a document that only passed with two-thirds approval by virtue of the violent action of his supporters to forcibly prevent opposition delegates from entering the assembly hall to cast their votes against it, the current situation will only worsen. I do not see any other immediate remedy available and I fear the clock is ticking on the chance to avoid a dreadful outcome. Though we may have reason to doubt the accuracy of some of the early returns, it appears clear that the overall results of Sunday's National Recall Referendum in Bolivia will maintain Evo Morales in power as the country's President and the "Catastrophic Tie" (as described by his Vice President Alavaro Garcia Linares) that has left one of Latin America's poorest countries in a state of complete political stalemate will continue into the near future. In the Quick Count results of Sunday's vote, Morales received approximately 62% approval nationwide for continuing to serve out his presidential term, though four of Bolivia's nine departments returned negative votes calling for the revocation of his presidential mandate. These included three of the four departments of the Media Luna, Santa Cruz, Beni, and Tarija; while the fourth, Pando, was split right down the middle with only 51% voting against the recall, though a conflicting report states that Morales lost there. A similar vote was returned in the department of Chuquisaca, which went narrowly against Morales. And simultaneously, three of the country's departmental Prefects, i.e. "Governors," were recalled. These include one from the Podemos opposition in the capital department of La Paz, Jose Luis Paredes; one from Evo Morales's MAS party in the Department of Oruro, Luis Alberto Aguilar; and a third Prefect in the Department of Cochabamba, Manfred Reyes Villa, who announced that he will fight to maintain his position as he considers the referendum illegal. It may be that the result of the referendum will be one of increased polarization within Bolivia, which runs contrary to the intent to use the vote to break the political stalemate that has frozen the country's political and legal system for almost the entirety of this year. As it now stands, Evo Morales and his MAS Party hold solid support in the four western departments of La Paz, Oruro, and Potosi -- since it is likely that a new MAS Prefect will be elected in Oruro, a MAS stronghold; and they appear poised to take control of Cochabamba with the recall of Reyes Villa. The four departments of the Media Luna all returned strong votes ratifying their Prefects, which puts a final stamp of approval upon their recently-passed autonomy statutes; effectively fortifying Podemos and their associated groups in a unified opposition to Morales. Chuquisaca, which is something of a unique case having elected a former MAS supporter Sabina Cuellar as its Prefect earlier this year, seems to stand somewhere in the middle. Cuellar has broken with Morales and the MAS for their rough handling of the opposition during the Constituent Assembly which, supposedly, completed its work earlier this year. At the beginning of this month she prevented the Morales government from organizing Bolivian Independence Day festivities in the Chuquisacan Capital of Sucre when the Morales administration refused to give an official apology for MAS-initiated violence in the city last year which left three dead and 60 injured. Chuquisaca's rejection of Morales in Sunday's vote provides even more evidence that the five departments of the eastern section of the country, which now includes more than just the four of the Media Luna, have now thoroughly aligned themselves against the central government. And as was the case earlier this year, it is the Department of Santa Cruz which is taking the lead in increasing its confrontational posture vis-a-vis the central government. "[We attack the] opportunism of the partisan and political interests of the governing left, who allied themselves with the right to give rise to the law that validated yesterday's recall vote and with the referendum they sought to destroy departmental autonomy. . . . Today, the trap for liberty and autonomy has been defeated with its own weapon. The referendum has defeated the remnants of centralism. It has crushed the manipulations of the enemies of true change. . . ."
The triumphant tone also extended to near-incendiary rhetoric directed against Evo Morales. It was declared that because the Department of Santa Cruz had voted so overwhelmingly for his recall, that Morales would not be welcome there and Costas pointedly warned the President against attempting "to impose his illegal and racist Constitutional project because he will then have entered a blind alley with no way out." There was no mention of dialog with the Morales government in the speech, but it did announce concrete actions to be taken immediately. Costas informed his audience that a taxing authority would be implemented immediately to create a "Solidarity Fund" intended "to aid other departments" in addition to Santa Cruz. Finally; he made clear that his department will form a police organization that would parallel the National Police. There are some varying opinions in the early blogging from the "Bolivia watchers" in the blogosphere. The more moderate MABB Blog sees the outcome as essentially a draw that will not change the current stalemate -- ". . . The referendum changed very little of the situation. . . . This means the two sides will keep on pressing their agendas. . . ." The harder-hitting Bolivia Confidencial put the matter as a setback for Morales, stating that he "did not do well," and that "the results do not strengthen the perspective of imposing a new constitution." They also charged that "Evo's Pyrrhic Victory" was the "fruit of a grand fraud," charging that there were massive voting irregularities in which the country's electoral courts were complicit for their inaction. There is no word up yet on the Santa Cruz-Bolivia blog, which we might expect to be the hardest-hitting of all. I think it matters much less to hear what people, and especially political leaders, say about the results of an election. What really counts is what they do in the wake of a vote. The two most important pieces of information I have gleaned from the aftermath of the recall referendum in Bolivia are both taken from the speech of Santa Cruz Prefect Ruben Costas; the foundation of a new taxing authority and the creation of a parallel police force that will compete with Bolivia's National Police. These are significant steps that represent a restructuring of the state, in terms a political scientist would use, since the former implies a new use for police power and the second implies a new police body. This tells me that the autonomy movement is not ready for dialog at this point but instead intends to continue with its project for creating new institutions within its own departmental borders and, perhaps even more dangerously, outside of its territory as evidenced in its offer to share the tax revenues with the other departments seeking autonomy. We are not merely witnessing one department moving to erect its own autonomous institutions; these are steps designed to create a trans-departmental governing authority that will only move to divide Bolivia further. The question is, does Evo Morales understand all of this? That test will come when and if he recognizes that his very undemocratically-written constitution must be scrapped if he is to have any chance of holding his country together. Without that decision, I believe we are witnessing the beginning of the division of Bolivia into a democratic eastern and a non-democratic -- I hesitate to write "Socialist" because so much of the MAS program seems to embody racial and corporate statist policies -- western section whose unification may only exist at the most abstract levels of authority. I think Bolivia is on the verge of splitting in two and what that portends for the future may be troubling. I have two other worthy blog entries to direct everyone's attention to at this time, which I only discovered after posting this entry Monday evening. At Daniel's Venezuela Blog you will find a very interesting discussion "Of the uselesness of recall elections," which not only asserts that the situation in Bolivia may have worsened as a result of the referendum -- I agree as you can read above -- but it may be that Bolivia is at the brink of secession and possible civil war. Daniel draws some very interesting and thoughtful parallels with the American Civil War, but his conclusion is most valuable: ". . . Now, they all have only one option, to climb down from their mutual arrogant positions, no matter how valid those ones are, and renegotiate the constitution project to send it to referendum. If this does not happen then the most probable outcome will be the break up of Bolivia. . . ." I think that is spot on the mark. I highly recommend this post. And finally, Bloggings by Boz has a short post -- aren't they all? -- in which he also sees the stalemate continuing into the near future. Well I'm back from my summer vacation and it's time to get back to blogging. I've got several things I have been watching and which I intend to address over the upcoming week; especially some recent events in Bolivia. But for now, let me just respond to a "heads up" I've been given from a recent visitor to another of my posts here and put up this bit of useful information. TellChávez.com is a new website that has opened to publicize awareness of the repeated human rights violations in Venezuela and, much like many of the sites and organizations who are supporting recognition of the rights of Cuban political prisoners, they are calling for the same for those Chavez now holds in Venezuela's jails. They have a letter posted which you can sign -- as I did -- which will be sent and they are attempting to raise public awareness as well. I wish them success and I am inviting them to keep me informed.